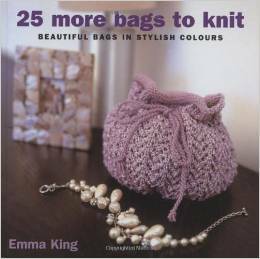 Following the success of the first book in the series, "25 More Bags to Knit" is another enchanting compendium of must-have bags. An oversized carryall is a stylish alternative to the everyday schoolbag; whilst a bubble-gum pink pompom bag makes an ideal accessory on an afternoon outing with the girls. Looking for a dramatic evening bag? A metallic satchel adds instant glam to any ensemble. Each bag is illustrated with full-colour photography and accompanied by easy-to-follow step-by-step instructions. A workshop section at the back of the book focuses on various embellishment techniques. From everyday handbags to weekend carryalls to sophisticated evening clutches, this spirited book boasts an exciting collection of contemporary styles designed for beginners and seasoned experts alike. Emma King has created a charming collection of classic and contemporary designs with timeless appeal.